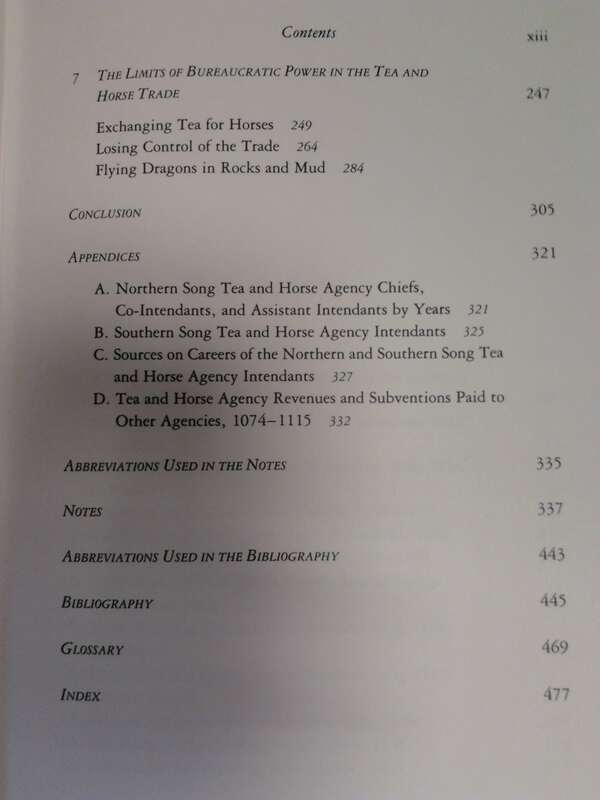 Taxing Heaven’s Storehouse (Horses, Bureaucrats, and the Destruction of the Sichuan Tea Industry, 1074-1224) unofficially belongs to a trilogy of books (that I’ve grouped together) on the evolution of the tea economy in China from about early Tang until at least the end of the ROC. I’ve already reviewed one before (Harvesting Mountains); the other is Green Gold, arguably the most well-known of the three. I intentionally left Green Gold for last; my first intent was to read them roughly ‘in order’, but Taxing Heaven’s Storehouse was such an intimidating book, I went for Harvesting Mountains first. The book focuses mainly on trade during the Song Dynasty(ies), but starts by setting up the economy during the Tang Dynasty leading into the Song. The focus is on tea and horse trade with Tibet; at the time, war houses from Tibet were superior to those found in China. After a time, Tibet accepted tea for trade, so an effort was made by China to export a large bulk of its tea to Tibet from Sichuan. The book does a lot of setup for understanding the economy leading up, and how it effected the evolution of the Sichuan tea economy. It’s a bit much to follow (like I said, very long book) and there’s chunks where I zoned out because it wasn’t focusing much on tea; it also spends a lot of time on the political economy of Tibet and China. But there was a lot of really interesting information on Sichuan tea, and I got a couple of pages of notes form that alone. Maybe enough for its own post. Sichuan was credited as the birthplace of compressed tea, and also continued on perfecting it long after other provinces moved on to loose tea (the whisked and brewed tea eras). This is because Sichuan was the major provider of tea to Tibet, which preferred compressed teas, so Sichuan purposefully held itself back as other provinces evolved. If you like a lot of politics, general China history, and economy, this is definitely worth a read. If you don’t have the greatest attention-span and just want Tea Facts, this might not be the best brick to pick up, but I still think it’s worth it. 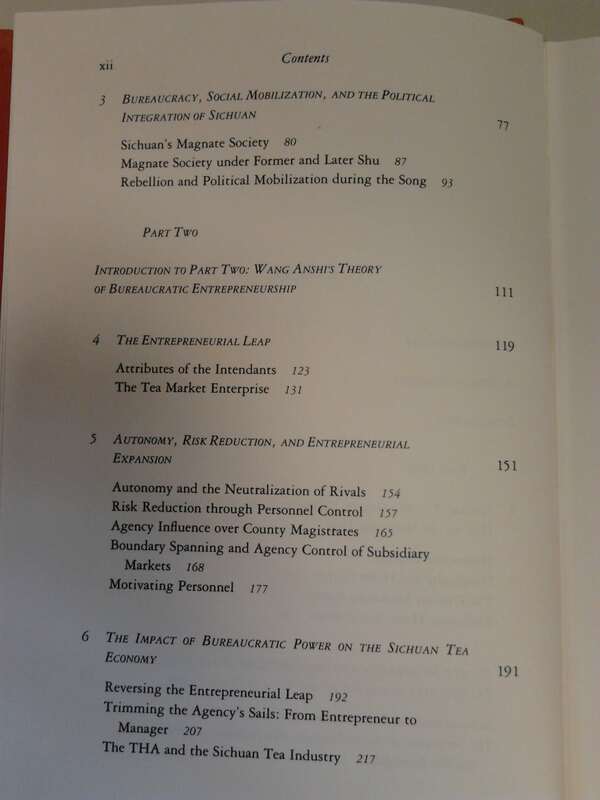 I’m interested in finishing the book; I’ve photographed and included the table of contents below (since it’s an older book, I was unable to find a copy online to link). 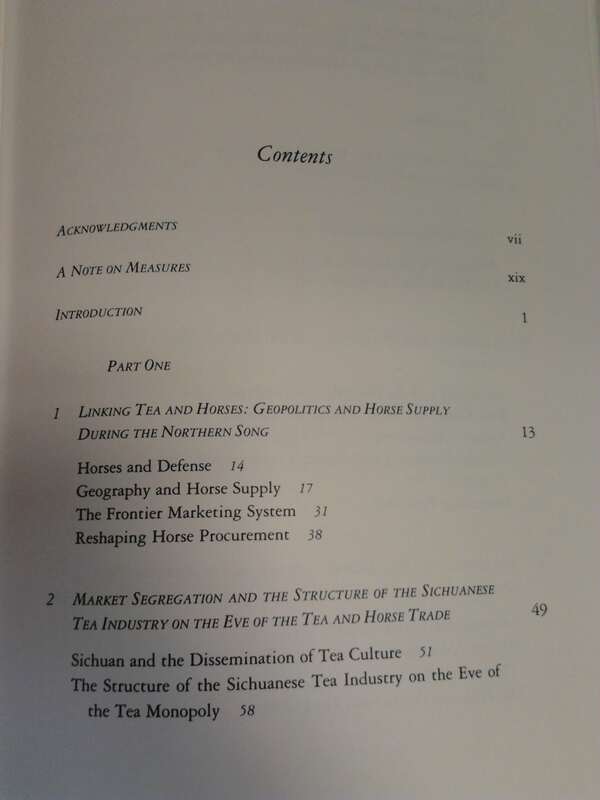 Can’t tell from the list alone whether it’ll focus more or less on tea, but you can’t really have a book on tea trade/economy without detailing the economic climate and influencing factors behind it. This book is on my “to find list” and I will wait for your next review of it.